Over the past couple of years, the popularity and profitability of the cryptocurrency markets have grown exponentially. Most notably thanks to the price surge in Bitcoin. Furthermore, it’s recent developments, and price swings have drawn the attention of many high profile individuals on Wall Street. Many have ridiculed cryptocurrency investments as being a bubble such as Warren Buffett. On the contrary, others have praised the blockchain network as the most innovative development in technology since the internet. Undoubtedly, it’s hard to ignore the noise of cryptocurrency investors and enthusiasts. Whether they be pessimistically or optimistically speculating. Even more so, it’s impossible and illogical to deny that you can’t make millions from a cryptocurrency investment. With so many individuals buying and selling on a regular basis the market has become sufficiently liquid, creating self-made millionaires overnight. Large investments are being made on a consistent basis especially in cryptocurrency mining. Droves of people from all around the world are setting up large cryptocurrency mining centers to harvest crypto coins such as Bitcoin, Litecoin, Ethereum and many more. For those of you who may be unaware as to what cryptocurrency mining is precisely, let me first explain the blockchain network. Essentially the blockchain network is a decentralized global network of computers that manages numerous transactions. For example, suppose I send one bitcoin to my friend. Somewhere else in the world two random people confirm this transaction in a ledger (blockchain). For instance, it would read something like “friend one sent friend two, one bitcoin” in both ledgers thus confirming and validating the transaction. These validations are considered mining. In essence, this is what miners do. In exchange, they are rewarded with cryptocurrencies, as many of them are volunteers. The way miners obtain these transactions is by solving complex mathematical problems. Similarly for things to run smoothly and to keep track of all the transactions flawlessly, you will also need the best software on the market currently for your preferred platform. Without further a due let’s get into it! Before establishing what are the best cryptocurrencies to mine for each specific hardware will go through a brief background on the hardware used for mining and individuals personal preference towards each, along with there pros and cons. More often than not, many individuals tend to opt for a cheap CPU for mining to maximize profits. Word around the crypto markets is that CPUs aren’t as relevant as they once were when it comes to mining. There’s more and more emphasis placed on GPUs. However, contrary to popular believe this just isn’t true. Getting the right CPU for your mining rig is just as important as a powerful GPU. For those of you unaware, the CPU is the central processing unit of the computer. In essence, they are the brain of the computer. Currently, Intel and AMD dominate this market. However, with the latest developments in cryptocurrency hardware, individuals are wondering is it still possible to mine cryptocurrencies with your CPU. Not so long ago you were able to mine at least 100 bitcoin with just your CPU alone. Unfortunately, times have changed. With the developments of ASIC’s, it’s no longer possible to mine bitcoin using only your CPU. On the contrary, that doesn’t mean that there aren’t cryptocurrencies out there that can’t be mined using your CPU. Unfortunately, the popular cryptocurrencies such as Bitcoin, Lite Coin, and Ethereum are impossible to mine with a CPU. Simply, CPUs can’t perform the tasks as quickly as ASIC systems. With that said, the cryptocurrencies still potential minable with just a CPU would be; Electroneum, Bytecoin, and Monero. What Is The Best CPU To Use For Mining? Perhaps you want to try mining with a basic computer set up and CPU. However, if you do really want things to run smoothly a high processor complemented with a high-end graphics card will get the job done. In fact, graphics cards are considered more powerful and effective for mining cryptocurrencies. While GPUs are not as powerful as ASIC systems they can be more flexible when it comes to completing various tasks. For those of you that may not be aware, GPU stands for graphics processing unit. Essentially what a graphics card does is render all display functions such as pixels, textures and colors. However, the little chip in the graphics card which is used to render these display functions is also used in crypto mining. In fact, with the latest craze around cryptocurrency mining, the demand for graphics cards has skyrocketed. Retailers and manufacturers have set caps on how many graphics cards any one individual can buy at any given time. As a result of this increased demand and the shortage of GPU’s the price has also skyrocketed. Currently, people are mainly using GPUs to harvest Ethereum. The reason there is such a demand for graphics cards to harvest Ethereum is that there is currently no ASIC system available to mine this cryptocurrency. The reason being that Ethereum uses an Ethash algorithm which is essentially ASIC resistant. In addition to Ethereum, you can also mine various other cryptocurrencies such as Electroneum, Gold, Bitcoin, Zcash, and Monero. What Is The Best GPU To Use For Mining? As mentioned above, there’s another piece of hardware used to mine cryptocurrencies. In fact, it’s probably the most popular piece of hardware when it comes to crypto mining. An application specific integrated circuit (ASIC) is the most popular piece of hardware for mining. With the use of a single powerful chip, it’s uniquely created to complete a hashing algorithm as soon as possible. To put into perspective just how powerful these devices can be, a CPU mining Bitcoin is 100’000 times slower than a Bitcoin application specific circuit. The great thing about these devices is that they’re specifically designed to handle a unique single hash algorithm. For instance, you would need a different ASIC for different crypto coins such as one for Bitcoin, a different ASIC for Lite Coin and another for Ethereum. As of this moment, there are only seven companies that specialize in the design of ASIC devices such as, Canaan and Bitmain. Unfortunately, these devices come at a price. Due to there demand and unique nature a powerful application specific integrated circuit won’t come cheap. In order to achieve full high-end hash processing, a single device could set you back $3000. Hence why many average Joes looking to get into crypto mining tend to settle for an array of graphics cards. Initially, I would have recommended for starters mine using graphics cards and then reinvest profits and work your way up to one of these devices. However, on the contrary, with the price rise in graphics cards, it makes sense (if you have the money) to get one of these devices alongside a couple of graphics cards. What Is The Best ASIC system at the moment. What Cryptocurrency Should You Mine And With What Hardware? Now that we’ve established how and what the hardware is used for, we need to match the cryptocurrency to the specific hardware to achieve maximum results, as previously stated. Back in the day, the majority of cryptocurrencies were minable with a basic PC (basic CPU, basic GPU, motherboard etc). Unfortunately, times aren’t that simple anymore and the game has changed for various reasons some of which we’ve already highlighted above towards each specific hardware. Predominantly the shift towards more powerful hardware was caused by the rise in network difficulty of some popular cryptocurrencies. Furthermore, the rapid development in ASIC devices surpassed traditional CPU and GPU mining. To help match the hardware you’ve invested in, we’ve highlighted the best cryptocurrencies for you to mine. Check it out! As we mentioned earlier, in this day and age it’s impossible to mine with your CPU due to the limitations outlined above. However, fear not, there is still some altcoin out there that you can harvest. For those of you unfamiliar with the terminology, altcoin is an abbreviation for bitcoin alternative. The reason they’re called altcoin is that they hope to improve upon or replace some bitcoin component and take the throne as the most dominant cryptocurrency. Unfortunately, there’s not much money to be made in altcoins but don’t get your hopes up. If you’re only starting to mine for the first time mining altcoins is a great place to start. Similarly, that doesn’t mean that there aren’t altcoin currently on the market making massive price movements and creating self-made millionaires. They’re just very rare to find. As previously stated there are a few cryptos you can still mine with a relatively set up. Check them out! Electroneum is a relatively new crypto coin having made its official ICO back in September 2017. Since then it’s price has not surged drastically. However, that’s not to say that this coin doesn’t show a lot of potential promise. Electroneum was created on the advanced version of CryptoNote algorithm meaning that it’s ASIC resistant. What’s really compelling about this coin for miners is that not only can it be mined using a CPU/GPU but it can also be mined using your smartphone. In fact, the coin was created by targeting smartphone users specifically. In order to mine Electroneum, you will either need to use ETN mobile miner who is currently available on the Google Play Store. Or you will need to download XMR-STAK 2.2 onto your computer. Once you’ve got your rig set up and software downloaded you’re good to go! Happy mining! In contrast to Electroneum, Bytecoin is an altcoin that has grown in popularity (and price) drastically over the past year. In fact, it has had a 5600% price increase in 2017 alone. Meaning if you invested $1000 in this altcoin in 2017 you’d have $5’600’000. An astonishing return! The reason for the surge was predominantly due to the fact that Bytecoin was to be listed on the Binance exchange. For those of you that may be unaware, Binance is an international exchange of cryptocurrency. However, trying to find altcoins like this one is similar to finding a needle in a haystack. It’s always dependent on demand and what people are willing to pay for it. Having said that, if you can diversify $1000 euro across numerous of different altcoins one is bound to make a surge. And all it takes is just one altcoin to be set! Similar to Electroneum, Bytecoin is completely anonymous peer to peer transactions and is also ASIC resistant. Meaning that it’s architecture is also built on CryptoNote. As recommended by the coins official blog the best software to use when it comes to mining Bytecoin is Xmrig. In fact, the Xmrig software is broken down into three components when it comes to mining. Xmrig offers software specifically for CPU mining, GPU mining using an AMD graphics card and finally a software for mining using a Nvidia mining software. Similar to Bytecoin, Monero also experienced a recent surge of popularity in 2017. In fact, only recently did Monero cryptocurrency experience a price surge of over 200%. Currently, it’s now considered one of the most popular Altcoins on the market as of this moment. Just like the previous two cryptocurrencies, it’s architecture is built around CryptoNote meaning that it’s also ASIC resistant. However, it can be mined using a basic computer rig set up with only one GPU. In order to mine Monero you can either use Wolfs CryptoNote miner if you’re using just a CPU for mining or you can use MonersSpelunker if you’re using a GPU for mining. Both of these software have been officially recommended from the coins website. Zencash, while not as popular as other altcoins it does offer some serious potential to be the next big hit. Zencash architecture is based on the Zcash, zero-knowledge protocol. Meaning all your transactions are almost fully anonymous. In fact, as more people began to understand the underlying technology behind it the price of ZEN rose 700%. In order to mine Zencash, you will need for your basic rig the Nicehash software. Word of warning this only works with Windows. Furthermore, if you’re using an AMD graphics it’s recommended you use Claymore’s ZCash GPU Miner. In addition, if you’re using Nvidia graphics card, it’s recommended that you use EBWF’s Cuda ZCash Miner. As of this moment, Ethereum stands just behind Bitcoin with the second biggest market capitalization. Surprisingly, it is still possible to be mined using a CPU / GPU. Overall, it’s the most popular crypto coin to be mined on a GPU other than Bitcoin. In order to mine Ethereum, you will need Ethminer. This is the most popular GPU mining software for this crypto coin. In addition, you will also need to install Geth. This will help connect your machine (s) to the Ethereum network. 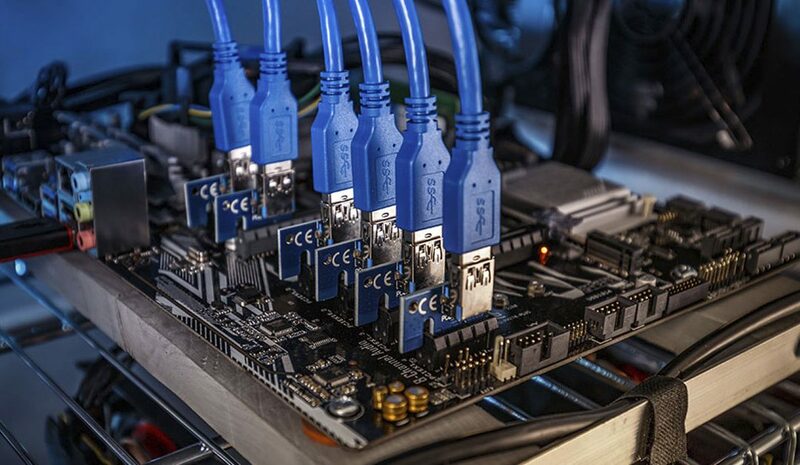 Predominately, ASIC units are used to mine Bitcoin. Mainly because they’re powerful enough to solve the mathematical problems quickly as well Bitcoin is not ASIC resistant. Back in the day, many people would mine Bitcoin using a CPU or GPU. Unfortunately, the competition for Bitcoin mining has become fierce. As a result, the hash rate and high difficulty is a product of the ASIC mining chips. The reason these units are preferred over CPU & GPU is that they’re designed specifically to carry out a particular task, as we’ve previously mentioned above. The process of mining Bitcoin using these devices is a little more complex than the other methods of using a CPU / GPU. Suppose you have an Antminer S9 ASIC unit for mining Bitcoin. In order to set this up, you will need to supply it with a lot of power. Currently, the S9 unit requires about 1275 watts of power. We’d recommend using a 650 watt PSU or 1000 watt PSU (gold rated) to power your miner. Connect the s9 unit to the PSU using a PCIe cable. From there you then connect an ethernet cable into the miner itself. Next, get on your computer and set it up on the same network as the miner. Once all this is done you follow the prompt screens suggested by your S9 and happy mining folks! The most preferred software for mining across most platforms would CGminer. According to most sources, it works best on Mac and Linux. However, there were some issues regarding the install on Windows. Most users reported that Windows defender alongside other anti-virus software prevented the download of CGminer. The reason is that hackers have also created there own version of this software available for download. Hence, you need to be extra cautious with regards to what version you download. The last thing you want is mine a bunch of cryptocurrencies and then have them suddenly go missing. CGminer has been time-tested having been around now for the guts of 6 years. The software itself has been coded in C hence why it’s available across various operating systems. It’s preferably used with ASIC units however it works just as well with GPUs. Mainly Bitcoin is mined using this software. The friendly straight line user interface allows for an easy installation and setup. In addition, it will also automatically detect what hardware you’re using for mining. Provided you have set up the hardware correctly. The software works via command line which isn’t the prettiest of navigations, however, having said that, it is very customizable. If you’re looking for an exclusive software to compliment your Mac than MacMiner is the way to go! This software has the exclusivity similar to IOS. However, it utilizes the power of the Mac fully. The installation and set-up are effortless and you can get mining in seconds. If you’ve used any other mining software for Mac you’ll understand how complex the whole process is. Within this software 3 of the most important mining backends are included such as CGminer as discussed above, CPUminer and bfgminer. What’s great about this is that it offers flexibility. It allows you to choose whatever hardware runs fastest for your mining setup. Whether that be your CPU, GPU or even you ASIC unit. This software not only allows you to mine big players such as Bitcoin and Lite Coin but also various other Altcoin. Another multi-platform software that works best on windows according to the mining community, Bitminer. Programmed using java, Bitminer has been around since 2011 and is regarded as one of the most reliable mining pools on the market currently. A simple interface allows for easy navigation and monitoring. Similarly, it automatically detects mining hardware such as GPUs and externally used ASIC devices. A complementary software that goes great with Bitminer is Bitminer Client. This exclusive software provides additional stats that add to the monitoring process. For instance, it will tell you the number of proofs that have been either accepted or rejected by the server. Similarly, this software works across a span of operating systems. However, it works great with Windows as it doesn’t require additional software to operate. Unlike Mac or Linux. As a matter of fact, this software is simply just a graphical frontend for the previous software we mentioned bfgminer. Often this software would be highly recommended to new miners as it’s powerful as it is easy to navigate. Once you install and launch the software it will navigate you through the various setup elements to get your mining pool in place. Furthermore, it will give you helpful pool mining tips and explain unfamiliar mining terms. Similar to other software discussed it will automatically detect your hardware, give recommendations upon setup and provide some useful statistics. One useful and motivational stat it supplies is your projected daily profit from your current set up. This will help tweak your set up on a consistent basis so you see your daily projected profit increase. While Multiminer serves as a graphical frontend to bfgminer. Easyminer actually serves as a graphical frontend to CPUminer and CGminer. Instantly after installation, you can get straight into mining after the “money maker” prompt appears. You just create a Lite Coin wallet and you can start mining in a private pool. Simple as. Furthermore, the elegant dashboard makes it a pleasure to customize your mining pools to your liking, view your wallet and adjust your network settings. The problem with EasyMiner on other operating systems is that antivirus software can really infringe on its operations. Over time it gets extremely annoying consistently getting prompted by antivirus alerts. Finally, we have BFGminer. Briefly, we touched on this software when analyzing the others above. However, will talk about it in a bit more depth. BFGminer is exclusive mining software for both Windows and Linux. In addition, it has been developed exclusively for ASIC mining devices. In this case, if you plan on using Linux to mine Bitcoin and have an ASIC device, well then, this is your software. BFG has a similar narrow focus to ASIC devices. This allows the software to perform quicker tasks more efficiently. One really beneficial feature this software carries is that it will stop connecting to unreachable mining pools which provides you with more system resources for other important tasks. In conclusion, we’ve highlighted the most valuable pieces of hardware for you to get started in mining or even take your DIY cryptocurrency mining game to the next level. Furthermore, we’ve also compiled the best software that compliments each operating system and each piece of hardware. Now that you’re brought up to speed there’s still a few things we need to go over. With every new fad there comes a wave of pessimistic people at the ready waiting for things to fail. As you are aware, much of this currently surrounds the cryptocurrency markets. This is mainly because not many individuals understand what’s going on. Does that mean things will fail? Absolutely not. Does that mean mining cryptocurrency isn’t safe? Not exactly. Nothing is safe. Having a job as a bank assistant isn’t safe. Running a full-time business isn’t safe. Walking down the road isn’t safe. There are many dangerous things that can happen at any moment in this life. However, what you need to do is come prepared. Plan ahead and anticipate anything that could go wrong and make the necessary adjustments. Check out his website if you’re looking for other ways to make money using crypto coins. There are a few points that need to be addressed when determining whether mining is safe. Firstly, the initial investment. As we’ve already highlighted this no cheap pursuit. You need to financial map out your goals such as how much you need to invest, the certainty of getting it back and how long it will take to recoup the cost. That’s the first thing. It wouldn’t make sense to invest in this equipment on the hope that you’re going to make money. You need to be certain. Plan what coins you’re going to target and how much investment is going to be needed to mine those coins etc. Furthermore, it’s often advised using two separate rigs if you plan on mining. One computer for your own personal use and the other solely for you cryptocurrency mining setup. The reason is as we’ve already highlighted that hackers created duplicate software that mimics that of mining software. You don’t want them to obtain all of your personal details too now, do you? Also if you’re a gamer and you already have a powerful rig specifically for gaming you don’t want all your system resources allocated to mining and taking away from your gaming experience. It could cause some serious overheating issues to your equipment. Other than the potential loss of serious financial investment and threat of digital invasion cryptocurrency mining is just as safe as any other profession. Just make the necessary precautions so that you don’t fall victim to these risks. While we’ve already discussed a lot about mining already from getting started to risk analysis, there are a few more important things to highlight that can help you out. Getting actively involved in this community expands your knowledge on the subject. Creating a dialogue with other various professionals, hobbyists and enthusiasts can unlock some key elements that could have a drastic positive impact on your cryptocurrency mining. Also, you’ll be the first to know of any trending developments with regards to various coins. Getting on the hype before anyone else is always a great profit making opportunity. Just like a vintage car, it’s important that you look after it. After all, this is your money maker. Keep a close eye on the statistics to see where most of your system resources are going. Ensure everything runs smoothly evenly across your system. Furthermore, it’s important that you tinker with your mining devices every so often to ensure there’s no overclocking or overheating etc. They will constantly need adjustment and that’s important. Especially if you want to maximize results. Similarly, with your software, it’s important that it’s kept up to date. Make sure you read of the recent updates to the software and check various forums to see if any problems with the software before installing. This could prevent countless future problems. At long last, the moment you’ve all been waiting. How much money can you potentially make from cryptocurrency mining? Good question. Earlier I highlighted that if you invested $1000 in Bytecoin in 2017 you would have made a 5600% return and would now be classified as a multi-millionaire. Well, if you mined Bytecoin as opposed to investing in it you’d be worth a lot more as you had no initial investment into the coin itself. The truth is, it’s very hard to pinpoint what’s going to be the next big coin. And while you’re spending time and money on valuable resources trying to find it all the costs add up. Some people get lucky and others go broke. That’s just the way it is. For instance, before anything else you need to recoup the cost of your rig. Secondly, you have to allocate time to mining which is an opportunity cost in itself. In addition, you also have to spend a lot of money running the rig as it’s very power intensive. At the end of the day it all adds up. Your profitability than depends on the popularity of the coin itself. There are various tools online or profitability mining calculators that can assist you in your potential profit. However, as we’ve stated, it’s important you do your projections initially before making a serious investment into this. Pinky’s Celebrity Club is a very easy-to-use and powerful desktop software that will allow you to gain Instagram post likes, followers and comments completely organically! The way it works is you login via your Instagram account, set hashtags and enter your comments. The software will then search for all posts that have your hashtags and then like them, comment on them and follow the users (you can tell what the software should do: follow, comment or/and like posts). This is a great way to organically grow your Instagram followers. The software simply does what you would otherwise do manually, but on a complete autopilot (24/7). The software also has some delay settings to make sure that all of your activity looks natural. Try PINKY’S CELEBRITY CLUB INSTAGRAM BOT FOR REAL FOLLOWERS AND LIKES for free and see for yourself just how powerful and easy to use the Instagram software is! It is acceptable the perfect time to have ideas to the longer term which is time for it to feel very special. I study this particular publish and if I’ll I want to propose you actually very few attention-grabbing difficulties and also guidance.. Don’t get obsessed with Forex. You could publish up coming content with this write-up. My spouse and i desire to master a lot more challenges regarding it! Thanks , I’ve recently been searching for info about this topic for a while and yours is the best I have found out till now. However, what about the conclusion? Are you sure about the supply?